I haven’t said much about the losses/scandal at MF Global. If Jon Corzine or any of his people committed crimes, I hope they spend the rest of their lives in jail, hopefully with big burly biker cellmates. And if this was just a case of bad investments, then I’m glad there was no bailout. Maybe the morons in Washington have learned something from the TARP fiasco. 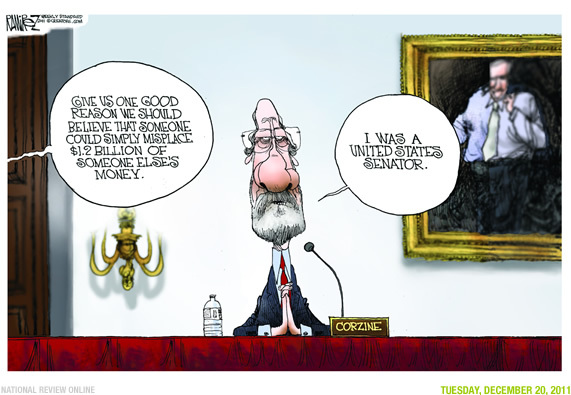 But if Corzine is charged with a crime, he does have a very plausible defense, as shown in this Mike Ramirez cartoon. And if you like Ramirez cartoons, you can see some of my favorites here, here, here, and here. It’s not funny to joke about people getting raped in jail. He has an even better defense: He was Governor of New Jersey!